In my October 22, 2012 post i discussed if there is a surgical decision point such as a 50% rule relating to missing cartilage where some surgeons decide to rebuild the alar cartilages or other nasal cartilage in general instead of using an assortment of different individual grafts and fillers. While still not knowing the precise answer to that question, the following article which i discovered after writing that article sheds some light on the issue, and it seems a bit more complicated then that. It emphasizes the advantage of anatomic reconstruction of the nasal tip cartilages instead of using nonanatomic cartilage tip grafts. Most techniques for secondary rhinoplasty assume that useful residual remnants of the tip cartilages remain but frequently the alar cartilages are missing- unilaterally, bilaterally, completely or incompletely- with loss of the lateral crura, middle crura, and parts of the medial crura. In such severe cases, excision of scar tissue and the residual alar remnants and their replacement with nonanatomic tip grafts have been recommended. Multiple solid, bruised or crushed cartilage fragments are positioned in a closed pocket or solid shield-shaped grafts are fixed with sutures during an open rhinoplasty. These onlay filler grafts only increase tip projection and definition. Associated tip abnormalities (alar rim notching, columella retraction, nostril distortion) are not addressed. Problems with graft visibility, an unnatural appearance or malposition have been noted. Fortunately, techniques useful in reconstructive rhinoplasty can be applied to severe cosmetic secondary deformities. Anatomic cartilage replacements similar in shape, bulk, and position to normal alar cartilages can be fashioned from septal, ear and rib cartilage, fixed to the residual medial crura &/or a columellar strut, and bent backward to restore the normal skeletal framework of the tip. During an open rhinoplasty, a fabricated and rigid framework is designed to replace the missing medial, middle, or lateral crus of one or both alar cartilages. The entire alar tripod is recreated. These anatomic alar cartilage reconstructive grafts create tip definition and projection, fill the lobule, and restore the expected lateral convexity, position the columella and establish columellar length, secure and position the alar rim, and brace the external valve against collapse, support the vestibular lining, and restore a nostril shape. 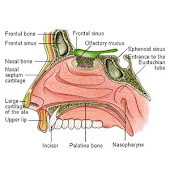 The anatomic form and function of the nasal tip is restored. This technique is recommended when alar cartilages are significantly destroyed or absent in secondary or reconstructive rhinoplasty and the alar remnants are insufficient for repair. Anatomically designed alar cartilage replacements allow an aesthetically structured skeleton to contour the overlying skin envelope. Problems with displacement are minimized by graft fixation. Graft visibility is used to surgeon's advantage. A rigidly supported framework with a nasal shape, can mold a covering forehead flap ro the scarred tip skin of a secondary rhinoplasty and create a result that may approach normal.